The name of our raft is “La Balsa”. It simply means “The Raft” in Spanish and we got used to call it that when we were constructing it: talking to the local people and procuring materials. So when the time was ready for the official documents, and we needed to name it, La Balsa surfaced as a natural, cute name. The name is short but exact and it even follows the rule-of-thumb (though this is modernly somewhat diluted) that vessels should carry female names: Balsa is a feminine noun in Spanish. The frame and house is constructed in bamboo, the floor from plywood and the roof from thin zinc-sheets. The entire structure is floating on 20 large plastic barrels, and is kept dry as these barrels are the only items in the water (except for rain, storms or damages). It has a total weight of 1500kg plus 700 kg of load which includes food, 3 persons, fuel, simple furniture, fireplace, kitchen, engine, solar panel system, firewood and personal items. The barrels deliver 20 x 200 liter = 4000 liter = 4000kg of buoyancy (i.e. flotation). With a total weight of approx. 2200kg, the raft is using 55% of its buoyancy capacity of 4000kg, which leaves us with some clearance between floor and water, known as freeboard, to keep our floor dry. We were in no specific rush and wanted to see the wilderness of Amazonia in a quite, magic, silent, natural, ecological, philosophical way and used the river currents as our main form of propulsion. 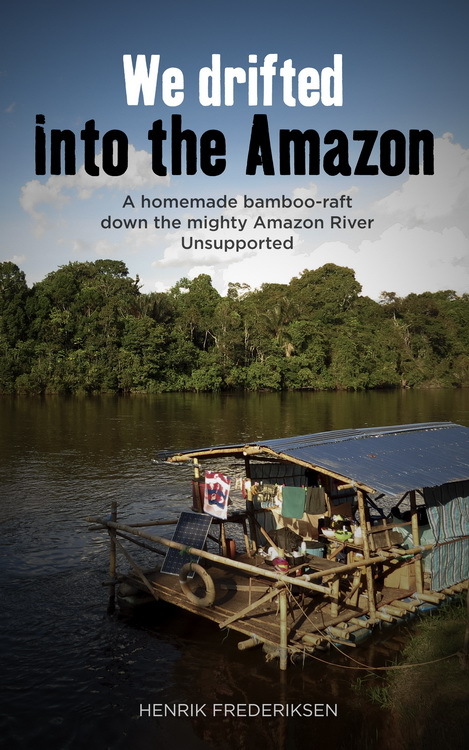 We left our departing city, Coca in Ecuador, without an engine and floated the first month and 800km down the Napo River, using only oars which offered very limited control of our heavy raft. Arriving at the confluence with the Amazon River we purchased an engine, to gain more control: in order to avoid collision with larger vessels on the Amazon and to have better options of stopping at the rivershore (out of necessity and curiosity). However, even with the engine, we still simply floated with the current and would only use the engine occasionally: to navigate to the shore for exploration and tribal visits, avoid ship collision and ensure that we could reach and dock in certain riverside communities for resupplies and border-issues. The cost of La Balsa amounts to roughly 1400 US Dollars, then add 800 US Dollar for navigational aid and licensing (GPS receiver, Satellite Phone, Registration, Permissions etc) and 1300 dollars for solar panel + engine.